We need you next Saturday (12 May) at the Latrobe Caltex Service station on the highway for a couple of hours. Volunteers Australia will be there with the AdoptaHighway van and they will equip us with the necessary safety equipment. Just bring a bottle of water, good shoes and a hat! Anything we find that may be suitable for the rigged raffle has to be passed on to Flasher, and roadkill goes to first finders. GoneAgain is gone again but do not let that be a slack excuse! We'd hate the Volunteer Australia crew come from Launy for nothing! 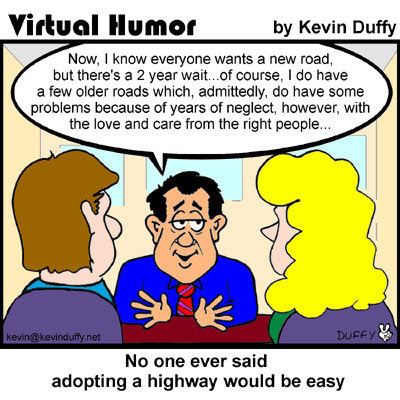 They may no longer let us adopt our piece of highway. Good stretches of road are hard to come by these days. May 7th, Monday 6.30pm Next Devonport r*n will be set by Poxy from Eugene Street, Devonport. May 22 Interhash Borobudur, Jogjakarta, Indonesia. June 8-10th Chardonnay Highland Fling @ Loch Pedder. Places are limited. If you intend going, please email Captain Condom (basiljf@gmail.com), A steal even for a Scot, at $90 Payment by direct deposit is available. 25-27 July 2014 Brussels, Belgium Think about it… Seriously!